Earlier theatre ('theatrical area' / odeon?) in hillside above earlier temple (Ionic, 3rd-4th century B.C.). Theatre and Temple both face down hillside. Temple surrounded on 3 sides by retaining wall (also temenos? ), but sufficient space to walk between temple and wall. Earlier temple, theatrical area. Big, big question-mark. Spoke to the excavator in Rome, perhaps one of these cases where it starts out with a question-mark, next time mentioned and so on, and then suddenly without a question mark, and then just referred to as a real thing bearing that in mind. Click here for further plans and drawings of this site. Later (second half of 2nd century B.C.) theatre and temple (traditionally ascribed to Herakles, but no concrete indications) built c. 200 m. to North of old theatre and temple, and at twice the size of the first. 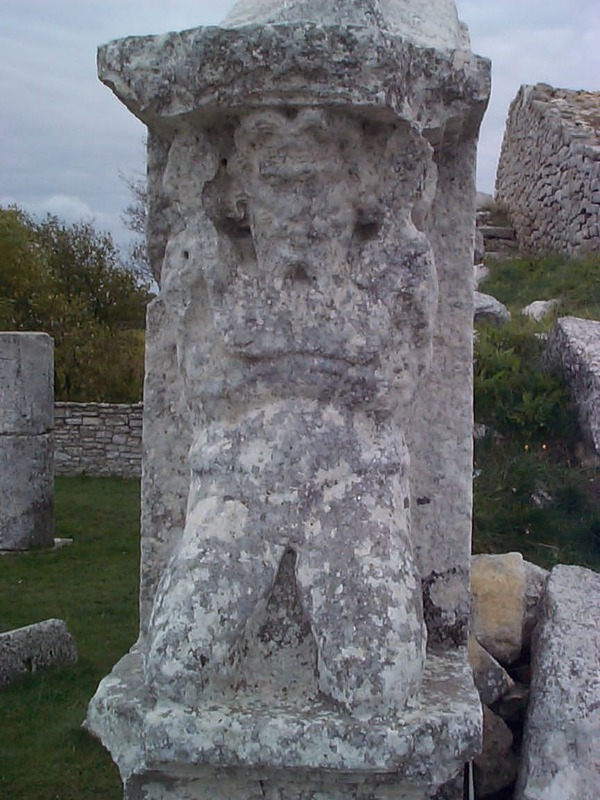 Possibly uses materials from first theatre &// temple, but there is no hard evidence of this. But now the spatial relationship between theatre and temple is inverted: both still face West down the hillside, but now the temple is above the theatre. Scaenae frons and temple facade are centred upon each other. Moreover, at the 'apex' of the cavea, there are steps to the bottom of the temple steps (leading up to the altar and facade). These steps serve as access to the upper cavea seats, but also open a strong visual connection between theatre and temple. Exterior wall of cavea is opus polygonalis. No neighbouring town. It is locus of pan-Samnite festival (&/ council? ), which included theatrical performances. As Samnite region had no major towns, only villages, this centre constituted focus of regional identity. There were 12-16 such Samnite centres. 2-D reconstruction of 2nd century centre displayed at site museum. View east from post-scaenam through porta regis across cavea towards temple. View west from temple across altar towards theatre. Steps from 'apex' of cavea visible just beyond altar. 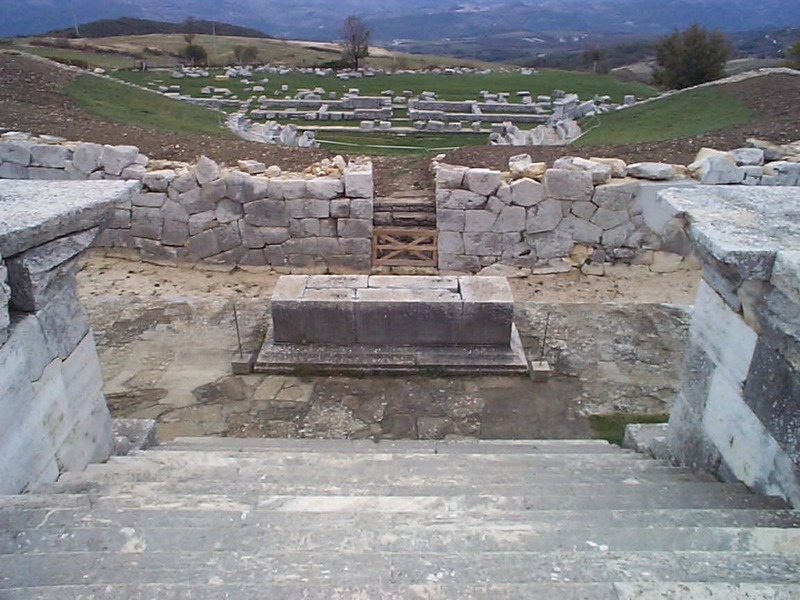 View north-west from temple pediment towards steps at rear of cavea. 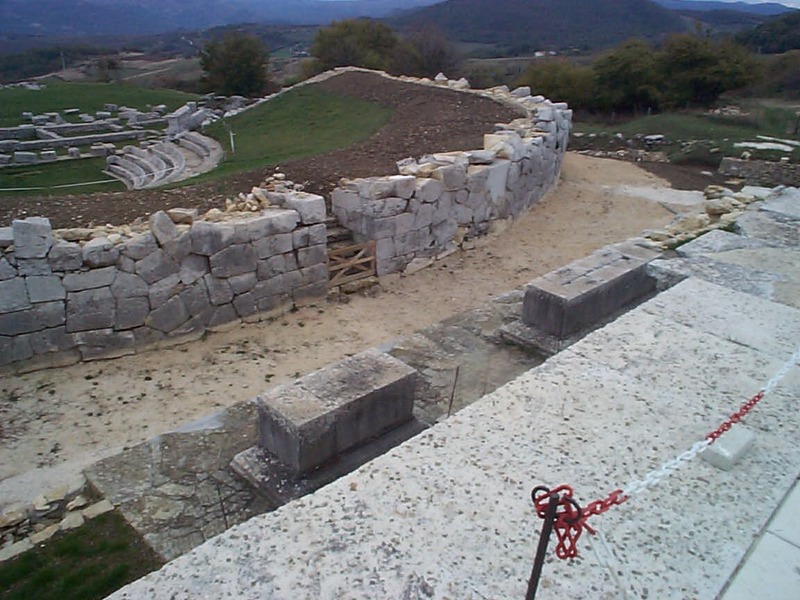 View west from rear of cavea towards scaenae frons. View north-east along opus polygonalis of exterior wall of cavea towards temple. 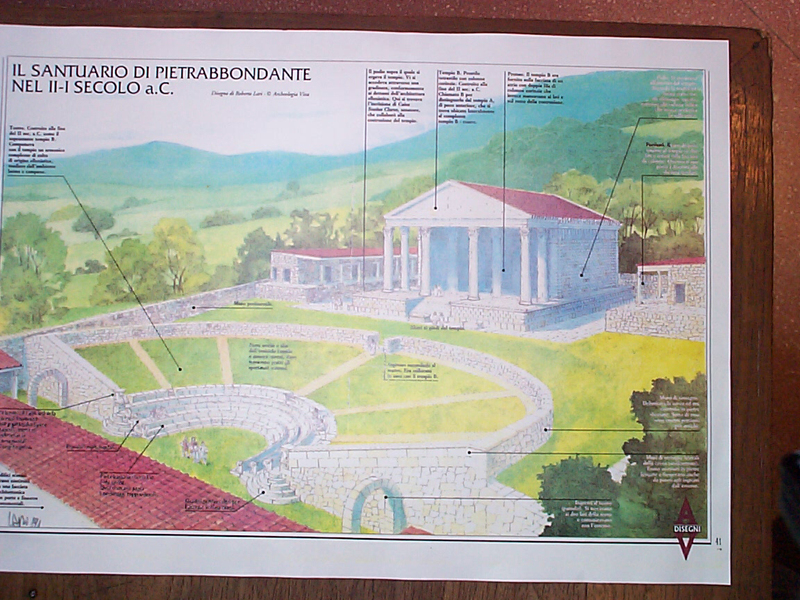 We have hard copy of Il Santuario di Pietrabbondante, published by Ministero per i Beni e le Attivita Culturali. 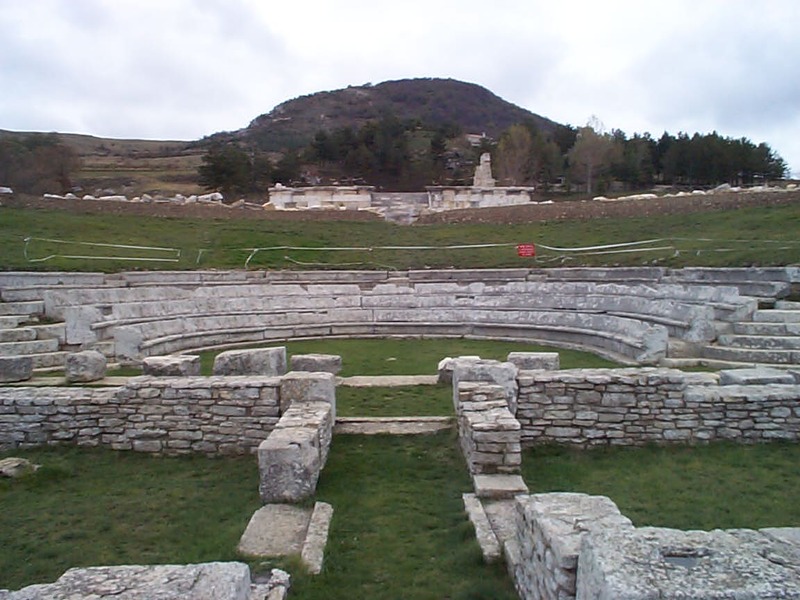 Graeco-Roman theatre. It belongs to a theatre-temple complex built in successive stages on the basis of a single project. Facing south-east. Built in the 2nd century B.C., it was no longer used after the sanctuary was abandoned following the social war. The semicircular cavea rests partly on natural land and partly on backfill. The lower part rests on the slope, but the upper part is completed by an embankment supported by a wall built in opus polygonalis. 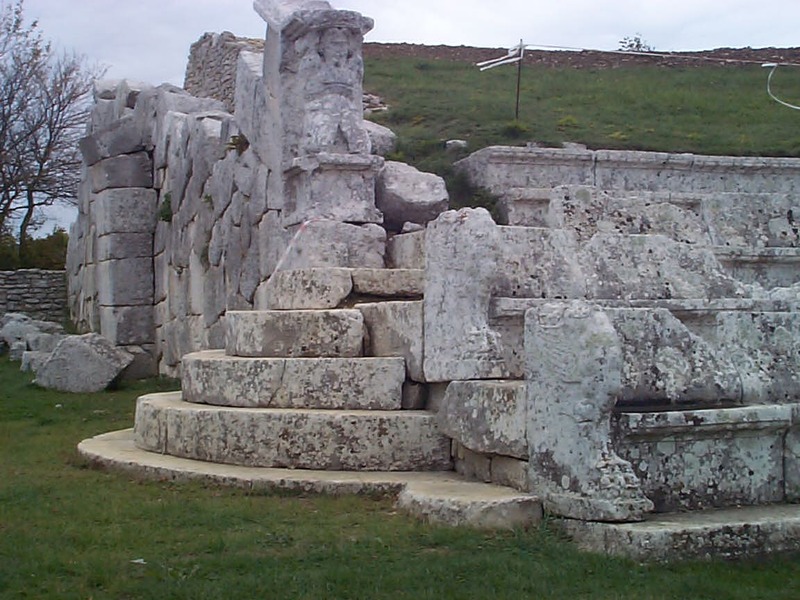 The proedria consists of three rows of stone seats with backrests. The seats end at the two extremities closest to the scaena with two armrests decorated with the paws of winged griffens. Two short semicircular flights of steps rise up to the parodoi and to a passageway. Seven small flights lead from the passageway to the upper part of the cavea. It would appear that the cavea's steps were not stone but wooden, and that the only structures consist of small walls containing the embankment. There is a small entrance in the wall terracing the cavea, on the same axis as the theatre (like the temple built at the rear). The analemmata, built in opus polygonalis, are formed higher up by a cornice, which is oblique to the orchestra and teminates lower down with two Telamons. There are two arches linking the analemmata to the extremities of the scaena. They culminate in two broad [capital gamma]-shaped parodoi providing access to the public. 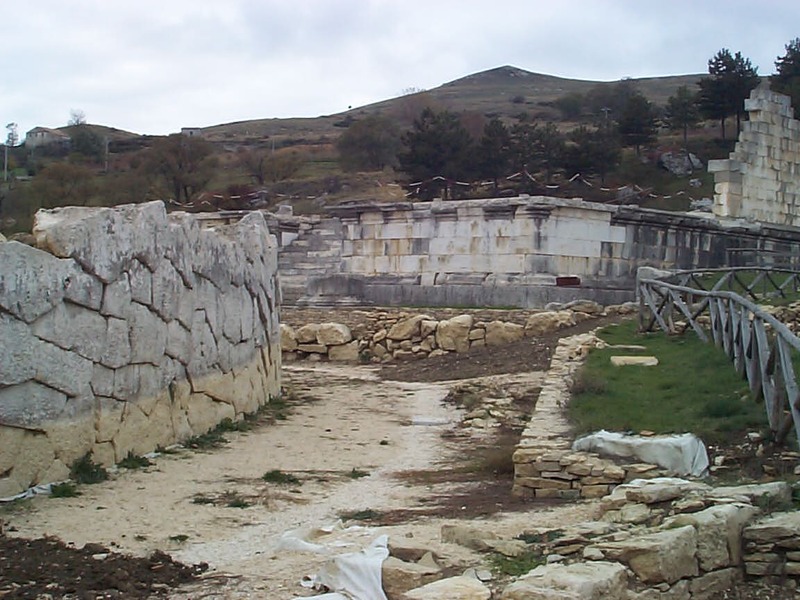 For historical reasons, the scaena was not modified during the Roman era. It was built in brickwork. The corners and ends, built in opus quadratum, can be clearly seen. The proscaenium is thought to have had an architectural decoration with five doors between small fluted semicolumns and a cornice featuring ovolos and dentels. The scaenae frons is thought to have been a bare wall bereft of decoration (there are still blocks on which mobile sets were put in place) onto which the three doors opened. 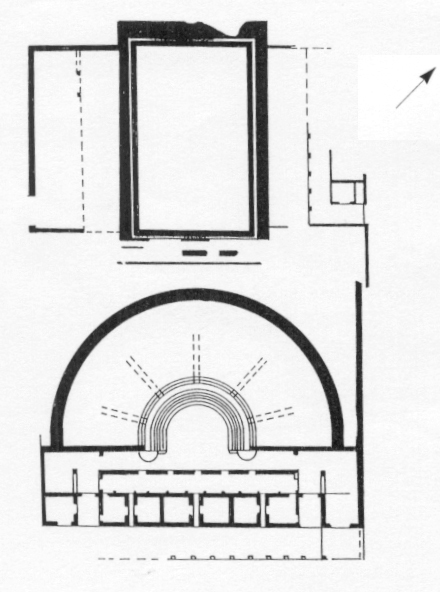 The stage building is divided into six rooms separated by a corridor for each door of the scaenae frons. Behind it, there are the remains of a portico. almost the entire top of the wall containing the embankment of the cavea and the analemmata is missing. Only a very small part of the elevation is preserved. The parts built in opus polygonalis are generally in poor, and sometimes very bad static condition. 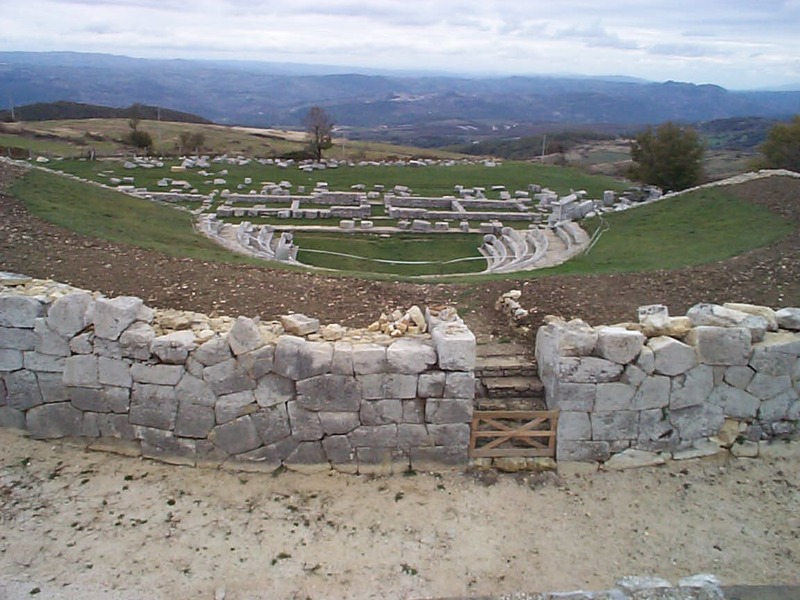 diameter of the cavea: 54 m.
diameter of the orchestra: 11 m.
height of the cavea: 7.15 m.
width of the scaena: 37.30 m.
depth of the scaena: 10.10 m.
it is used for theatrical performances. M.J. STRAZZULLA, Un santuario sannitico di Pietrabbondante, Roma 1972. A. LA REGINA, Il Sannio, in Hellenismus in Mittelitalien, I. Gottingen 1976, p.219 ss. H. LAUTER, Die Hellenistischen Theater der Samniten und Latiner in ihrer Beziehung zur Theaterarchitektur der Griechen, in Hellenismus in Mittelitalien, II, Gottingen 1976, p.413 ss. A. LA REGINA, F. COARELLI, Abruzzo, Molise, Bari 1984, pp.243-247. Theatre-temple complex pre-dating TP, with temple in similar relation to cavea as in TP although situated on a natural slope. If there was an earlier 4th century temple-theatre complex to South of this, the later site inverted the spatial relationship. Social/political/religious function of centre vis-a-vis that of TP.